TRAILHEAD ACCESS: From 1-90 Exit 80, go through Roslyn on Highway 903 to Lake Cle Elum, along the lake to FS Road 4308, west on 4308 to 4312, and northwest on 4312 to the trailhead which is at a gate on FS Road 4312-121. Walk along this road approximately 0.25 mile to trail. TRAIL: Parallels Thorp Creek through a partial cut for about 1.5 miles, gradually getting farther from the creek until the junction with Thorp Lake Trail which runs for 0.25 miles to the lake. Trail #1316 ends 0.25 mile further at the junction with Kachess Ridge Trail #1315. This is a nice trail, but it gets steep for the last mile. 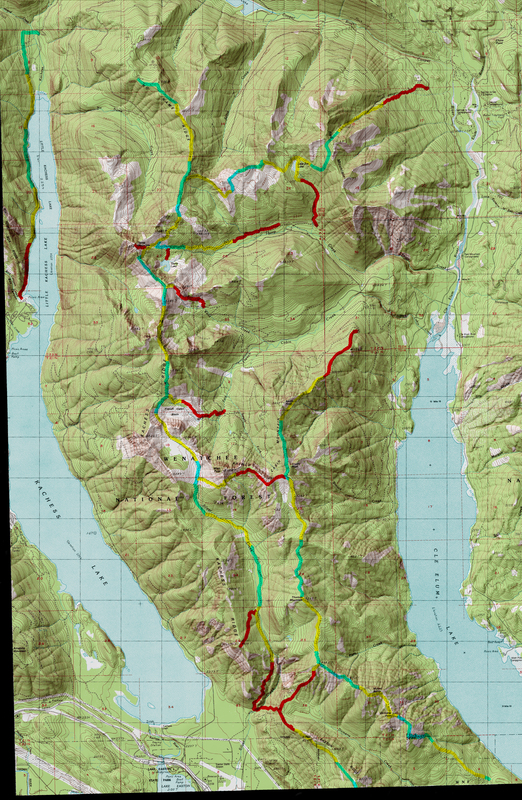 SETTING:	Large clearcut at the trailhead (1988) and partial cutting for the next mile, old-growth trees, grassy hillsides, valley bottom, stream, lake. OPPORTUNITIES:	Hiking, horseback riding, camping, fishing, scenery.